Paying for the Costs of Lost Utilities After a Hurricane | The Voss Law Firm, P.C. ?How can I better prepare myself in case my home or business is damaged during a hurricane? Your building may have escaped the worst of the damage from a hurricane, but the structure is only one factor in your business’ recovery. Some businesses will be forced to go without electricity, Internet, telephone service, or water for a week or more—and many companies will not survive an extended outage. Attorney Bill Voss explains how owners can protect their businesses by carefully selecting utility interruption endorsements to their insurance policies. 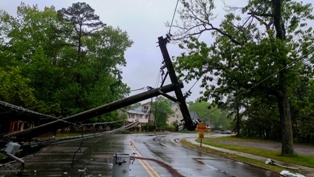 While commercial insurance policies may cover physical damage to a structure, they will often exclude coverage for losses caused by utility failure. An interruption in utilities can mean a total lack of the utility (such as a broken water main that cuts off water to the building) or a significant reduction in supply (such as an electricity “brown out”). Some policies will exclude utility failure damage completely, while others will exclude coverage for an outage that originated off the premises. The good news is that coverage for many of the excluded utilities can be secured through endorsements to the policy. Depending on the needs of the business, an owner may wish to select comprehensive utilities coverage, or select only the endorsements that are most likely to affect the property. Power and gas coverage. This coverage may include electrical outages, as well as interruptions in natural gas or steam. Your insurance may be tailored to cover an event at a power plant, problems at a substation, an exploding transformer, or downed transmission lines. If you select a direct damage endorsement, you choose whether you want coverage for your entire property or just a portion that is most susceptible to power loss. For example, if you have multiple onsite refrigerators for perishable stock, you can buy power interruption coverage for the refrigeration units only—as well as food spoilage coverage for perishable goods. Water supply coverage. Damage to pumping stations or broken water mains can cause a total loss of water to the structure, making it impossible to clean up the premises or even flush toilets. Businesses may still be unable to operate after water service is restored, since municipalities recommend boiling water after an interruption. Water interruption coverage can compensate you for the full amount of time it takes before your water needs are running at full capacity. Communications coverage. Communication loss can include telephone, radio, cable television, or Internet provider services. Extended coverage may include damage to communication transmission lines, coaxial cables, and wireless router and hub replacement. However, a communications interruption endorsement does not cover electronic data loss. This requires an additional network security or electronic data loss policy. Sewer coverage. Sewer backups can cause direct physical damage to structures, foundations, and inventory. A direct damage utility services endorsement acts as an extension of your property insurance policy, allowing you to claim utility damage to your property resulting from a hurricane (such as an overloaded drainage system). Business income insurance. Some policies cover interrupted utility services as an extension of the owner’s business interruption insurance. If a hurricane knocks out power to the building and the business cannot generate income, the insurer will replace a portion of lost income up to a time limit specified in the policy or until the service is restored. Extra expense coverage. This insurance is a worthy addition to any property damage policy, since it allows owners to claim an extra amount for any covered event that incurs unforeseen expenses. If your commercial policy includes hurricane damage and extra expense coverage, you may claim utility service interruption as an extra expense. If your insurer is refusing to pay for some of the losses to your business, we can help you get the maximum amount of coverage allowed under your policy. Simply fill out the form on this page today to contact an insurance attorney at the Voss Law Firm or order a free copy of our book, Commercial Property Owners Must Read This BEFORE Filing an Insurance Claim. What If the Insurance Offer for My Hurricane Claim Is Too Low? How Much Is My Hurricane Insurance Settlement Worth?